In one of the largest looming conflicts of his remaining Presidency, Barack Obama announced Washington D.C appeals court judge Merrick Garland to fill the Supreme Court seat left vacant by the death of Justice Antonin Scalia. In a direct appeal from the Rose Garden of the White House Obama pressed the professional and personal qualities of Merrick Garland, highlighting historic bipartisan praise for his nominee. Obama implored that expected Republican obstinacy to a hearing would be “an abdication of the Senate’s constitutional duty” and would impose irreparable damage to American democracy, asking directly for a hearing and an “up or down vote”. Justice Scalia was appointed to the court in 1986 by Ronald Reagan and had been a strong conservative voice on the bench. His judicial conservatism was rooted in his originalist reading of constitutional interpretation and led him to deny a constitutional right to abortion, deny the right of Guantanamo detainees to a full jury trial and vote to effectively end recounts of Floridian ballots in the case of Bush Vs. Gore (2000). The death of a conservative stalwart on the bench leaves the court balanced with four conservative and four liberal judges and the inclinations of the ninth justice will have profound impact on the most divisive issues in America. In the next year alone the Supreme Court is expected to hear the first major abortion case in nearly ten years, and cases on voting rights, affirmative action and immigration. In the hours following the announcement of Scalia’s death Republicans crowded media networks pledging their refusal to act until the next President has taken office. They cited the ‘Thurmond rule’ a non-binding conception positing that, from an undefined point, in a presidential election year the U.S. Senate should not confirm a nominee to the Supreme Court. The ‘rule’ has its origins in 1968, when Senator Storm Thurmond blocked LBJ’s appointment of Justice Abe Fortas to Chief Justice. Though the rule will play a large part in the discourse surrounding Obama’s nomination, it is not a precedent and has been used inconsistently by politicians on both sides of the aisle to fit political agendas. As you can see in the spreadhseet below, the ‘Thurmond rule’ has only been invoked once and was not followed by Ronald Reagan or the Democratic Senate in 1987. Republicans have continued to insist their refusal to hear the nomination of Merrick Garland is a principled stand protecting the integrity of the court from lame duck appointments. However it fits within the continued strategy of Congressional Republicans to oppose anything associated with President Obama. Since the rise of the Tea Party faction, the party has viewed Obama as liberal bogeyman responsible for the degradation of heartland America. A unified focus has been used to prevent Obama gaining any political victories. The stance is also reflective of one of the GOP’s great fears, losing the judicial branch of government. For decades the conservative movement has been able to rely on a bench majority to protect some of its fiercest ideological positions. The danger of losing the bench is particularly prescient as the party’s appeal becomes narrower as the party appeals to a decreasing constituency. The situation has been exacerbated by the rise of Donald Trump as leading candidate in primary season, and the perplexing remarketing of Ted Cruz, a true believer if ever there was one, as a consensus candidate. In return Obama has played politics himself. Faced with a determined opposition he has chosen to highlight the weakness of the Republican position by providing them with as moderate and widely praised nominee as could be found. 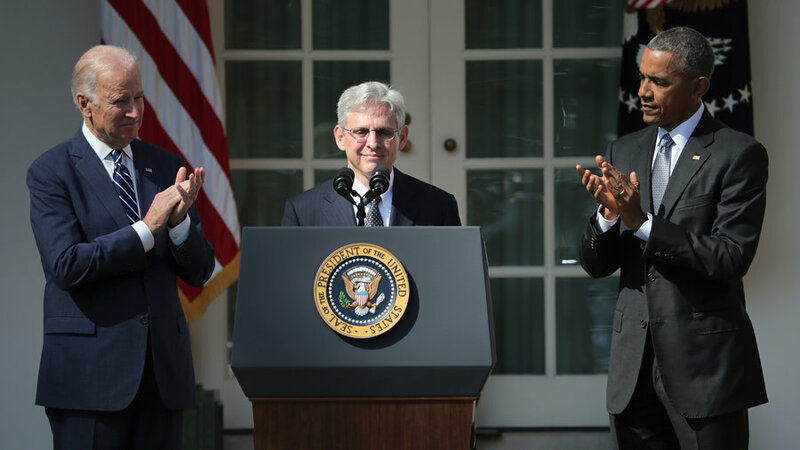 Merrick Garland is a 19-year veteran of the DC circuit and graduated with honours from Harvard Law School before clerking for Justice William Brennan. He has eschewed high paid jobs in favour of a career in criminal prosecutions that has seen him praised for his supervision of the Oklahoma bombings evidence and played a critical role in the conviction of the Unabomber. He has a conservative record of convictions, ruling heavily in favour of law enforcement. Furthermore, he has helped pave the way for stricter gun laws in D.C and ruled to prevent gun ownership for those seeking handguns as tool of self-defence. He was confirmed to the D.C Appeals circuit in 1996 by a Republican Senate – current Senators Hatch (R-U), Thad Cochran (R-MS), Dan Coats (R-IN), Susan Collins (R-ME), Jim Inhofe (R-OK), John McCain (R-AZ) and Pat Roberts (R-KS) voted in favour – and has been praised by Orrin Hatch, the longest serving Republican on the Senate Judiciary Committee, who described him as a candidate he would happy for Obama to nominate. Hatch has since walked back these comments and held the Republican line. Garland is also the oldest nominee to SCOTUS since Richard Nixon named Justice Lewis Powell in 1971, it is further indication that the attempt is not to entrench the bench with liberals but find an amenable moderate likely to serve a relatively short-term. Obama was never going to maintain the court’s status quo and nominate a Scalia disciple, but the nomination has shown the cerebral political nous the President exhibited passing healthcare legislation and negotiating the Iran deal. His nomination of Garland has backed Republicans into a corner, sticking to their guns while media presenters fire previous compliments of Garland at them as signs of cynical political manoeuvres. Obama has faced criticism from the left that his nomination of moderate is an uninspired consensus choice that has lost the Democrats the opportunity to shine a light on a young legal mind (Elena Kagan), an historic appointment (Sonia Sotomayor) or a future liberal icon (Ruth Bader Ginsberg). The remaining option for the Republican’s is to hear Garland’s case and fail to confirm him, either through vote or filibuster. But to deny a hearing to a moderate candidate, who has had such a distinguished legal career, would not only cement the partisan polarisation damaging American politics but would be considerable disrespect to the man himself. It may also leave them in a much weaker position should the election go to the Democrats and a strong mandate provide Hilary with enough momentum to elect a younger, dogmatic liberal. However Senate majority leader, Mitch McConnell, has dismissed the possibility of considering Garland even after November’s election. The refusal to hear a justice because it is a lame duck session has no constitutional foundation and represents the partisan political machinations poisoning Washington. It could be an understandable reaction if the circumstances were different. If the vacancy had been created by the deliberate and calculated retirement of a liberal justice at this time of Democratic majority in the Senate, then the Republican apprehension would be a well founded. However, the vacancy has been caused by the death of a justice and is not the product of political manoeuvring. The Republicans could do a lot worse than playing politics, accepting Garland and negotiating a trade off when the next vacancy opens. However, in light of GOP party dynamics, and the lack of independent appeal held by Trump and Cruz, the Republicans may create for themselves a lose-lose situation. The refusal to hear Garland may see him replaced with a more liberal justice nominated by a Hilary Clinton fresh from electoral victory. And if Clinton not only wins the general by a robust margin, but the Democrats have a good showing in Congressional districts, it could be the right time for Ruth Bader Ginsberg to be replaced by a young protégé. This piece was also published on the Orator and is accessible here.